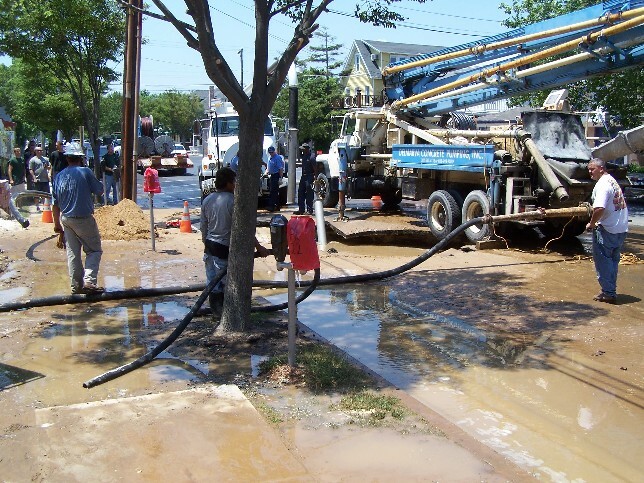 A waterline burst while a construction crew worked in front of the old Rehoboth Beach Epworth United Methodist Church in the ocean block of Baltimore Avenue around 12:25 p.m. Friday. Muddy water entered the storm-water drainage system and flowed into the surf via the Maryland Avenue outfall pipe. The northward current carried the muddy mix along the beach north past Deauville. The sudden change of surf color alarmed lifeguards who briefly called people from the water between Maryland and Virginia avenues. It took about three hours until the line was repaired and the roadway was patched for the weekend. Businesses in the first block of Baltimore Avenue, including the public restrooms, had been without water. Three metered parking spaces were lost this weekend as a result of the patched roadway. This is the outfall pipe for storm water on Maryland Avenue. The muddy water entered the surf and flowed north past the Henlopen. 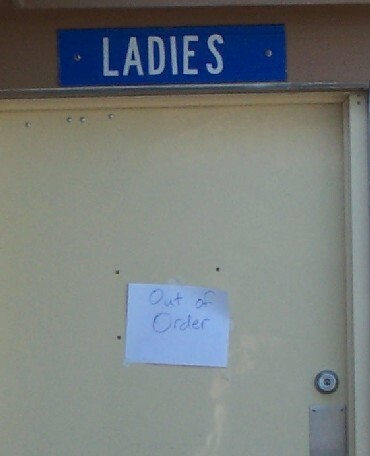 The public restrooms next to the beach patrol were without water and closed. Rehoboth Beach police, fire and EMS along with a state police helicopter, a Coast Guard helicopter and rescue boat searched the coast off Rehoboth for two persons possibly missing in the water. It started around 6:45 p.m. Sunday when police received a call from a witness who claimed two people were possibly in distress near an orange buoy 500 feet off the beach at Virginia Avenue. The witness went to call for assistance and the two people were gone when officials arrived. No reports of missing people were received, nor did officials find additional witnesses to suggest that anybody had disappeared. The police, fire and EMS personnel discontinued the search around 7:40 p.m. The Coast Guard continued searching past midnight. But the helicopter diverted to Slaughter Beach for another water incident around 9:45 p.m. A boat was supposedly stranded off Beach Plum Drive. The boaters were safely located and assisted back to shore, and the Coast Guard helicopter returned to Rehoboth. 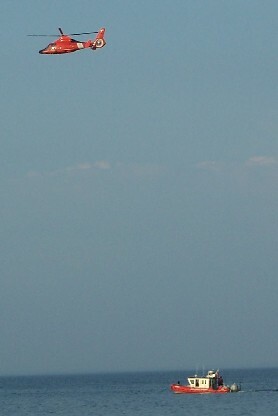 During the search the Coast Guard recovered six balloons and located a pizza box. At least three of the balloons were tied together. Police, fire and EMS officials set up a command post on the boardwalk at Virginia Avenue. Police talked with beach goers who spotted debris in the water off Baltimore Avenue. The Coast Guard helicopter said that turned out to be a pizza box. People lined the boardwalk to watch the search. Rehoboth Beach police received a sign complaint around 10:20 a.m. Saturday for Second Street at Columbia Avenue. The caller indicated a sign had been placed on public property. 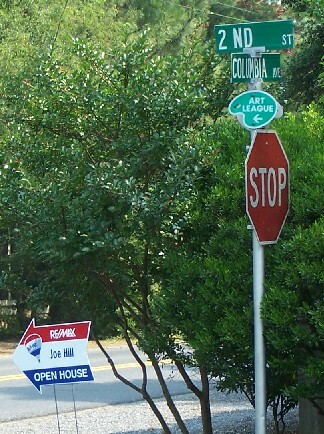 It turned out to be a RE/MAX - Joe Hill - Open House sign. An officer checked the situation and sought clarification. The dispatcher said she spoke with the Building & Licensing inspector who said such signs are prohibited on city property but he'd check it out. The open house, which was for 102 Henlopen Avenue, ended around 11 a.m.
City people often head to the shore to escape the smog. But this weekend, that wasn't easy. People all over Delmarva woke Saturday to a smoky haze and burning odor. 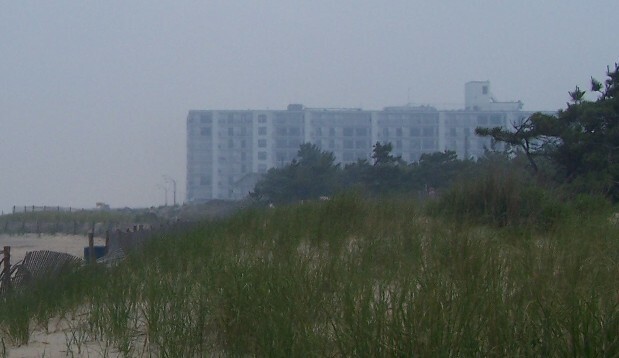 In the afternoon, the haze was noticeably thick along the beach and in the ocean block in Rehoboth Beach. The source of the smoke was supposedly a fire in the Great Dismal Swamp along the North Carolina-Virginia border which had been burning since June 9. That's about 170 miles from Rehoboth Beach. The 9-1-1 emergency centers as far north as Kent County (Delaware) received hundreds of calls. The Sussex County Emergency Operations Center issued this news release Saturday. 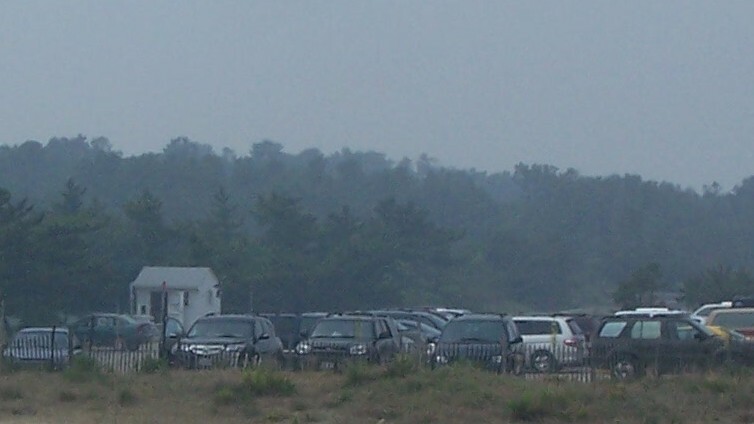 Pictured below is the haze over the Deauville parking lot and the Henlopen Hotel. A man suffered a head injury after a moped accident at First Street and Philadelphia Avenue in Rehoboth Beach. An officer discovered the man unconscious with injuries to the side of his face around 12:30 a.m. Sunday. He was breathing but unresponsive. Stephanie Callaway, Sussex County EMS spokeswoman, says the 52-year-old man struck some curbing and was tossed over the handlebars of his moped. He wore no helmet. He was in stable condition at Beebe Hospital. The moped, which has a Delaware license plate, appeared to be the only vehicle involved in the accident. Coastal Towing removed this GMC Yukon Denali around 1:55 p.m. Saturday after a lifeguard reported it parked in a beach patrol parking space on Park Avenue. The Lake Gerar bridge dedication and ribbon cutting was held on Friday the 13th. The bridge cost roughly $2.3 million. It is a single-span arch bridge constructed with six precast concrete pieces. 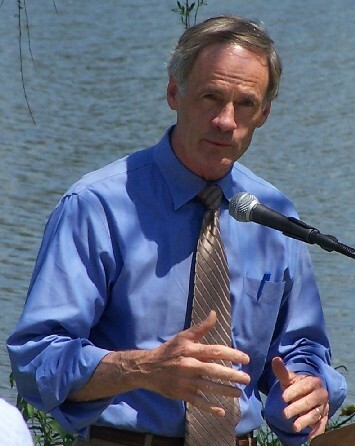 Senator Thomas Carper, who secured $1.6 million in federal funds for the bridge, addressed about 60 attendees Friday on the southeast side of Lake Gerar. 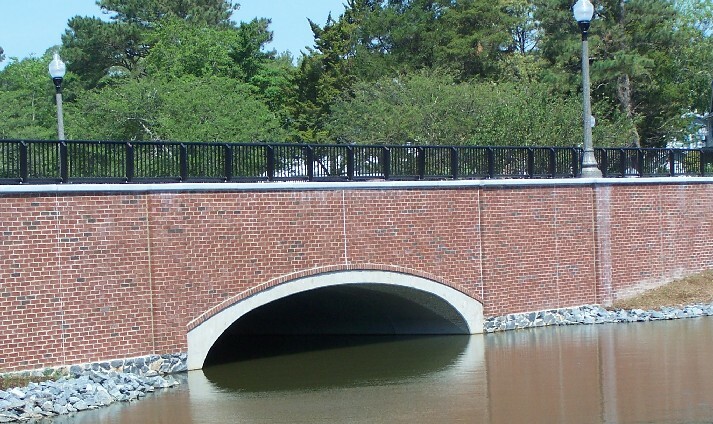 The 35-foot span over Lake Gerar connects downtown Rehoboth with North Rehoboth, Henlopen Acres, North Shores and the Gordon's Pond side of the Cape Henlopen State Park. Without it, motorists would have to use alternate routes such as Oak Avenue or Columbia Avenue. Construction started October 8, 2007 and the bridge opened May 23, 2008. 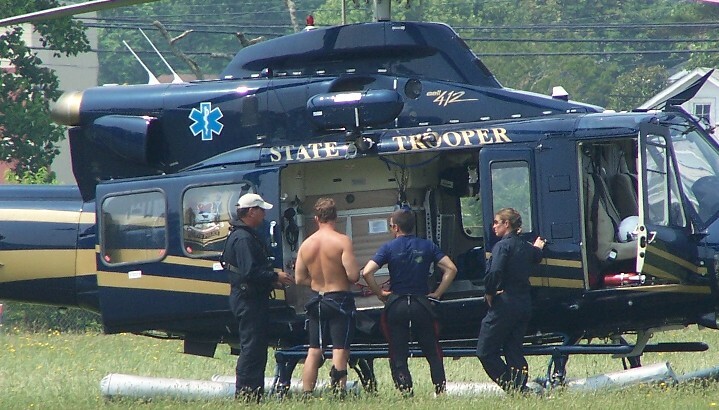 The state police helicopter, Trooper 5, landed at the Rehoboth Elementary School on Saturday. The crew spent the afternoon training with the Dewey Beach Patrol and the Rehoboth Beach VFC fire boat, Marine 86.